Baseball coaches from youth leagues on up always talk about how little things can make the difference between winning and losing. The New York Mets are no different, and one of those doing the digging for tips in the World Series is first base coach Tom Goodwin, who spent the last season of a top notch playing career roaming the outfield in the Atlantic League (Atlantic City, 2005). "We saw the numbers and teams steal bases against them (Chicago Cubs, the Mets' victim in the National League Championship Series), so we thought we could give it a shot," manager Terry Collins told NJ.com. "Even though we don't have perhaps the speed other teams have throughout the lineup, we've got a couple guys who can run, so we're doing (it). Tommy Goodwin does a great job of investigating how and why teams are being able to run." 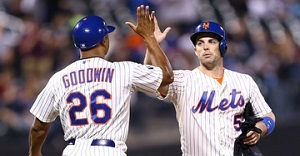 Goodwin's work at least indirectly helped in the Mets' 3-2 win over Los Angeles that vaulted them into the NLCS. Much was made of hero Daniel Murphy's sleek steal of an uncovered third base and eventual winning run in the final game, and the New York second baseman is another who praises Goodwin for his general hints. "(He) is always talking about keeping your head up," Murphy told The Associated Press. "I've never been in the playoffs before, but (I'm) starting to understand how valuable 90 feet are. It's absolutely massive." Goodwin hit .265 in 88 games for Atlantic City when he was turning 37. He had a career average three points higher in nearly 1,300 major league games with arguably his best years with Kansas City ('94-'97), the Mets' opponent now in the World Series. It looks like winning Player of the Year honors in the Atlantic League is only one of the reasons Welington Dotel will remember 2015. The Bridgeport outfielder is off to an amazing start in the Mexican League, leading everyone in average (.486), at-bats (70), hits (34), total bases (57), runs (17), triples (6), on-base percentage (.520), OPS (1.334) and stolen bases (10) after 16 games. No one is close to him in several of these categories. Previously the chief spokesman for Commissioners Bowie Kuhn and Peter Ueberroth, Bob Wirz has been writing extensively about the Atlantic League and Independent Baseball since 2003. He is a frequent contributor to this site.